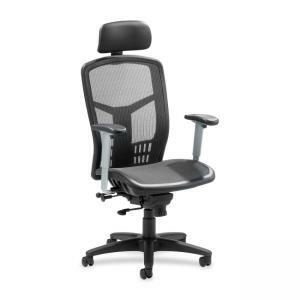 High-Back Mesh Chair offers a mesh back and seat with plastic-coated steel frame. Upholstered headrest adjusts in height. Arms with polyurethane arms pad adjust in height and width. Functions include pneumatic seat-height adjustment, seat glide mechanism, 360-degree swivel, tilt tension and synchronized knee tilt. High-back chair meets the CA117 fire retardant standard.